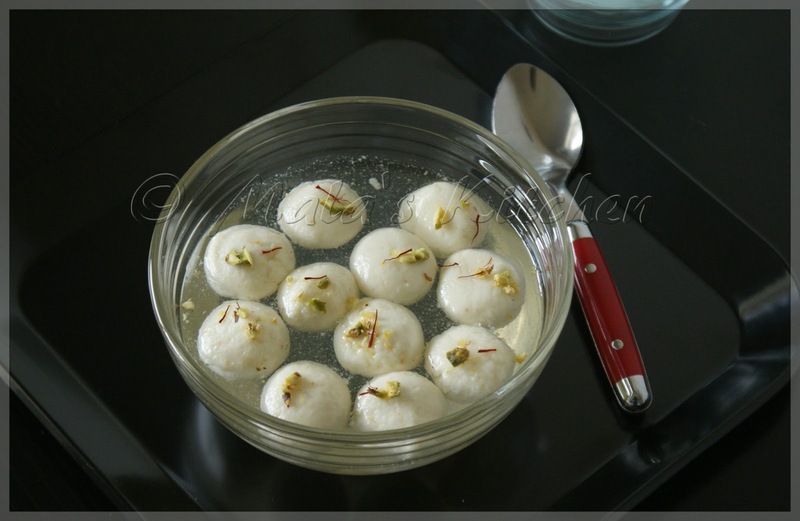 Rasgulla is a famous Sweet dish from the Eastern Part of India. Made out of Cottage Cheese and soaked in sugar syrup. Its delicious and the texture is soft & spongy. 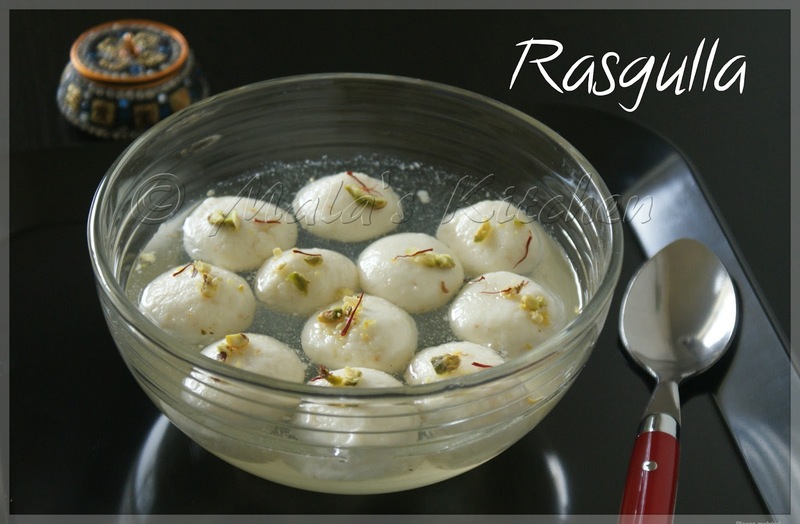 This is very similar to Rasmalai which is soaked in Milk Syrup where as Rasgulla is soaked in Sugar Syrup. I always bought Haldiram’s Rasgulla which is good but I always wanted to make it fresh in my kitchen. Tried several times before I got it just right. Finally made it for the New Year. What better way to start the New Year with a sweet dish. Happy New Year 2014 to you all. 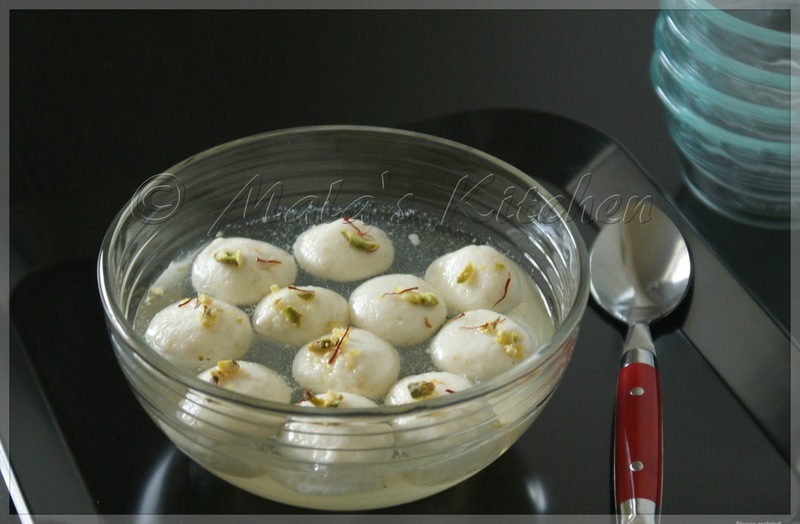 May this year be sweet, for everyone, just like Rasgulla. Pour lemon juice and stir slowly. It starts curdles. Then throughly curdles transfer into muslin cloth (i used cheese cloth, available in Bed Bath Beyond Store) strain through cheese cloth and squeeze out all the water. In the running water clean the whey to get rid of lemon flavor(smell). squeeze out all the water and hang it for a while to set the paneer. In the mean while make a sugar syrup ; Add sugar and water in a thick bottom pan till sugar dissolves and bring to boil add cottage cheese balls close the lid for few 8-10mins in the low flame to cook and paneer balls will be double the size. Switch off the flame transfer into bowl. Refrigerate and serve chill or room temprature. Garnish crushed pistachios and saffron strands.